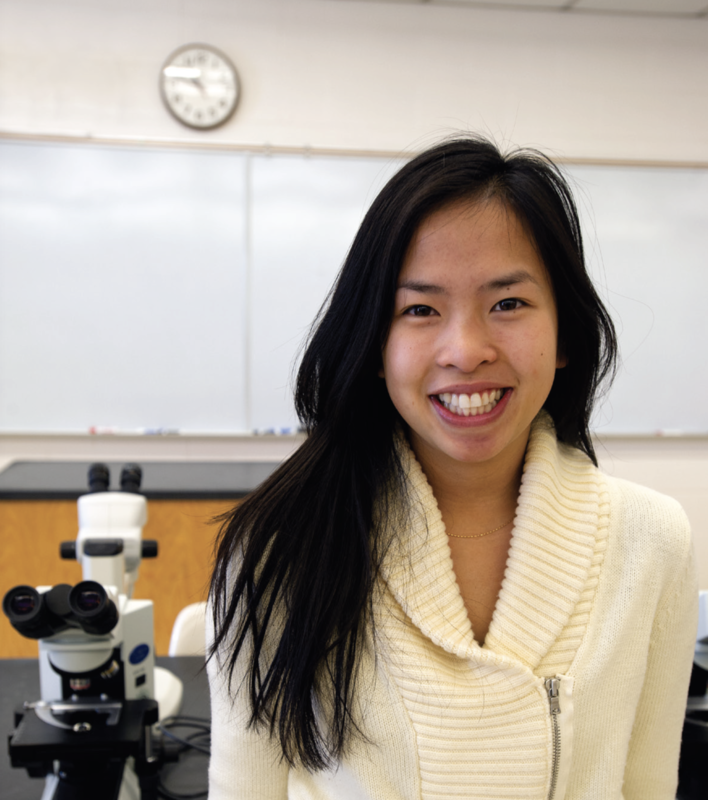 Kim Dao ’14 earned her degree in biology and was accepted to Tufts Medical School through the Early Assurance Track. She spoke to a group of alumni in Boston last winter about her experience at UMaine, and recently fulfilling her goal of becoming a physician. I GREW UP in Saco, Maine, but my parents are originally from Vietnam. Both of my parents came to the U.S. from Vietnam determined to build a better life. From a young age, I observed my parents’ strong work ethic and unyielding devotion to provide for our family. They both worked long days, six days a week in order to maintain our family business, a nail salon in Biddeford, Maine. They encouraged my siblings and me to do well in school and in every aspect of life. They wanted us to have the educational experience they were never able to receive. Remembering all the individuals who helped them come to the U.S., they taught us to not only appreciate but also take advantage of the opportunities we have and to remember the people who helped us get here. From my family and volunteering, I’ve learned that very simple acts can have a significant impact on people’s lives, and I think that lesson has carried my optimism over the years. So the beginning of this whole dream started when I was in the sixth grade. I passed by a nursing home on my way to school, and one day I started volunteering there, meaning I painted elderly ladies’ nails and played Bingo with them. I kept volunteering, and two years later, after I volunteered at the Special Olympics held at UMaine (my first time on the Orono campus!) I realized that my career calling would be medicine. That experience — seeing both what people can do despite handicaps, and the group of people supporting them — convinced me that I wanted to be there for others when it counts. DURING HIGH SCHOOL, I continued to volunteer and immerse myself in different health care settings. When I was a junior, my guidance counselor told me about something called the Early Assurance Track, which provides an opportunity for college sophomores in the University of Maine System, Bates, Bowdoin, and Colby to apply for early admission to Tufts University’s School of Medicine. It was a highly competitive process with a limited number of spots available. However, my guidance counselor told me that a high percentage of Early Assurance Track selectees come from UMaine, so I went after it! I spent my senior year of high school preparing for my UMaine application with the intention of applying to medical school at Tufts in the next couple of years. Fast forward to the summer of July 2013: I was a rising junior at the University of Maine and received my acceptance letter to Tufts. I was free to pursue my passions for the rest of my undergraduate career without the worry about trying to make myself appealing to medical schools. I was also free from the worry about financing my undergraduate studies. Coming from a family of four kids, UMaine was an easy choice over expensive private liberal arts colleges. Financial concerns were not the only reason I chose to attend UMaine, but knowing that I intended to go on to medical school, it was important to me to keep my undergraduate expenses low. After gaining acceptance to medical school, the next two years at UMaine were some of the most defining in my life. I continued participation in service organizations such as Black Bear Mentors, UMaine Mitchell Scholars, Operation HEARTS, Sophomore Eagles, and Alternative Breaks, through which I made lifelong memories and friendships. Prior to my senior year I was chosen for All Maine Women and, in the fall of 2013, was elected student body president. And during the summer before starting medical school, I worked in Washington, D.C., at the U.S. Agency for International Development, conducting research on disability inclusive development and projects promoting gender equality in developing nations. These experiences were possible because I went to UMaine. There’s a common perception that more expensive liberal arts colleges are prestigious and offer a higher quality education than what is available at state schools, such as the University of Maine. The reality is that the University of Maine offers more resources, connections, and possibilities to those who seek them. That’s especially true with the liberal arts education available through the Honors College, with its Great Civilizations curriculum and rigorous thesis project. WHEN I INITIALLY entered medical school, I went in with the mindset that the next four years were going to be different — not only academically, but that I would have to put service aside and focus solely on academics. I thought that’s what I would have to do to become a good doctor. But when the school year started, the first month felt unnatural, like something important was missing. Then I thought back to two individuals who I look up to, both who have financially contributed to my education: Dr. Carolyn Reed (Class of 1972) and Senator George J. Mitchell. Dr. Reed was a brilliant academic who excelled in a difficult specialty and was also an exceptional teacher who received teaching awards for her dedication to students. Senator Mitchell is not only a state and national leader, but a role model internationally. He visited every high school in Maine, something he didn’t have to do but he wanted to because that’s how you get to know your community. I felt an obligation to honor their legacies. I decided I needed to resume my service work as an important part of my medical education, for personal fulfillment, and to uphold the values of those who were gracious enough to support me. I found that service work humanized the rigorous science courses of the first two years of medical school and kept me sane and grounded. So while at Tufts for my first two years, I became part of a non-profit organization that offered free, unscheduled health care to the medically underserved populations of the greater Boston area. I also worked with incarcerated individuals, and had the pleasure of spending some afternoons with my 11-year-old mentee through Tufts’ Children’s Floating Hospital program KICS, which stands for Kids in Chemotherapy and Their Students. Through the Tufts-Maine Track Program, I was placed at Mid Coast Hospital in Brunswick for my third year, where I completed my Longitudinal Integrated Clerkships, or LIC. It’s a curriculum set up so that students are able to follow patients in a longitudinal fashion, following them from the doctor’s office, to the OR, and even the delivery room. That year was an incredible experience and strongly influenced my career specialty. And then, in my fourth and final year of medical school, I had the opportunity to travel to many places in Maine, the United States, and internationally, meeting medical students from other schools and countries. And more than ever I appreciate and value my time at UMaine and the Honors College. If you’ve ever seen Senator Mitchell speak, he often talks about how the people and children of Maine are special. How we can compete with the best of them, not only on a national stage, but internationally. And I couldn’t agree more. And taking it a step further, I believe wholeheartedly that’s true of the students and alumni of the University of Maine. We are the best. My ultimate goal is to practice family medicine in an underserved area of Maine and open a wellness center, a facility that offers classes, group visits, and other services based not solely on the medical needs of the patients but their interests too, moving beyond the physical boundaries of a medical office to integrate healthcare into the community. Many professionals are limited in what they can achieve because of debt. In 2017, the average medical school debt for a Tufts graduate was $219,500. However, I had the benefit of financial aid made possible through UMaine. One of the scholarships I received was the Carolyn E. Reed Medical Scholarship, which was available to students graduating from the Honors College. I also received a Gilbert Loan, which is a program offered through the UMaine Foundation that provides low-interest loans for UMaine graduates pursuing medical, dental, or veterinary school. The scholarships and loans I received through UMaine meant that upon graduating from Tufts in May, I had the freedom to choose from many possibilities that students with heavy student debt loans would not have. TO CONCLUDE, I want to share with you something one of my mentors said to me. She described the medical profession as an opportunity to lessen the misery index of the world. She said the success of a physician doesn’t take away from the success of another, and that helps define us as a united community. I thought deeply about that observation and I realized the university is formed with a similar spirit. I have seen first- hand the opportunities made real by the university, through the foundation’s mentors and donors, be it assisting a student to work at the Library of Congress or helping me finance medical school. The people who have traveled through the UMaine campus are brought back by the relationships they formed, the acknowledgement and appreciation of those who helped them on their journey, and the wish to pay it forward. It is a campus of mostly young people, all seeking to fulfill their dreams. But it’s also a community that extends to every corner of the state and across the nation. As the state’s flagship university, UMaine is truly the incubator for the success of the state. I am a product and beneficiary of that incubator. I know that. It means I don’t take lightly the guidance and mentorship and financial assistance that helped me on my way to train to be a physician. I look forward to my opportunity to do my part, armed with the knowledge that little acts make a big difference.